The “Blog” of “Unnecessary” Quotation Marks: hey, "better"! Come over here! Emilie spotted these in a home depot. 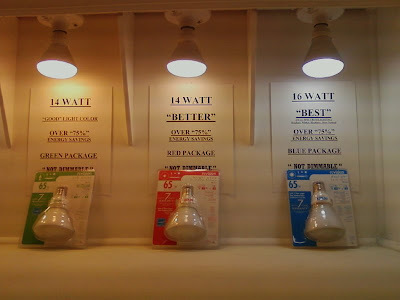 Evidently they MAY be dimmable, who knows the energy savings, and they have nicknames, but they are dumb.